A little bit late in posting, but the officers and members of the LFC are happy the announce the new promotion of one of our own. In February, Matthew Eick took over the role as EMS Captain. Contained in this announcement is an article by the Unionville Times for your reading pleasure that can be found at http://www.unionvilletimes.com/?p=38686. Matt Eick, a 16-year veteran of EMS, is the new Captain of EMS for Longwood Fire Company. He began his duties in February. “In my new role I have total oversight of the ambulances and Emergency Medical Services,” Eick said. “I manage a staff of nine full time, 14 part time and 10 volunteer EMS staff. Eick began his EMS career in 2002 and became an Emergency Medical Technician in 2003 and a Paramedic in 2008. 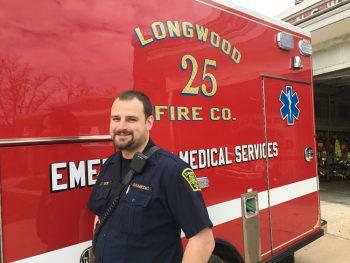 “I started at Longwood as a staff paramedic part time in June of 2010 and took a full-time position in January of 2011,” Eick said. Longwood Fire Company has served the communities of Kennett, East Marlborough, Pennsbury and Pocopson townships since 1921. Longwood Fire Company provides fire and rescue and emergency medical services 24 hours a day, 365 days a year. For more information, see www.longwoodfireco.com.